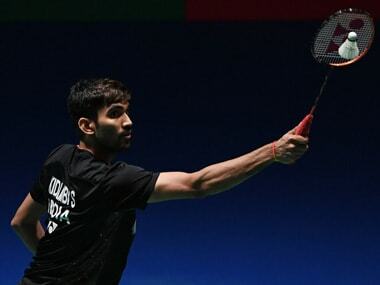 Kowloon: Olympic medallist shuttler PV Sindhu suffered an unexpected loss in the second round, but Kidambi Srikanth and Sameer Verma advanced to the quarterfinals to keep India's flag flying at the Hong Kong Open World Tour Super 500 tournament on Thursday. World No 4 Sindhu, who was seeded third here, was shown the door by Hyun Ji Sung of Korea 24-26, 20-22 in fighting 59 minute duel. With Sindhu's exit, India's challenge ended in the women's singles after Saina Nehwal had made a first round exit. But India's men's singles shuttlers had a good day in office with Srikanth and Sameer progressing to the last eight round, albeit with contrasting results. 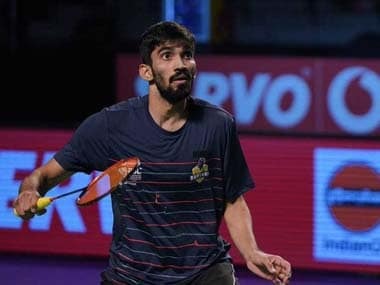 Fourth seeded Srikanth, who had claimed a silver medal at this year's Commonwealth Games, had to dig deep in his reservoir to outwit fellow Indian HS Prannoy 18-21, 30-29, 21-18 in a thrilling match, clocking an hour and seven minutes. Srikanth will face either Japan's Kenta Nishimoto or Thailand's Kantaphon Wangcharoen. Sameer, however, qualified for the quarterfinals after his formidable opponent, Olympic champion Chen Long pulled out of the competition due to injury. He will face either Denmark's Hans-Kristian Solberg Vittinghus or local hope Lee Cheuk Yiu on Friday. However, mixed doubles pairing of Satwiksairaj Rankireddy and Ashwini Ponnappa lost 17-21 11-21 to Chinese Taipei's Lee Yang and Hsu Ya Ching to bow out of the tournament. Men's doubles pair of B Sumeeth Reddy and Manu Attri also failed to clear the second round hurdle, losing to Chinese Taipei combination of Jhe-Huei Lee and Yang Lee 16-21 15-21. Earlier, the match between the two trainees of the Pulella Gopichand Academy turned out to be a pulsating contest as former world no 1 Srikanth did the catch up act with Prannoy enjoying the early spoils. Prannoy, who had defeated Srikanth at the Senior National final last year, moved neck-and-neck till 9-9 before the former jumped to a 14-10 lead. Srikanth clawed back at 15-15 before Prannoy again moved ahead to secure the opening game. The second game was a cliffhanger as the duo played out of their skin, giving nothing away. After a close-battle, Srikanth grabbed a slender 11-10 lead at the break, which evaporated soon as Prannoy took a 15-12 lead. Srikanth again drew parity at 16-16 and moved to 19-17. However, Prannoy took two points to make it 19-19. After that, there was nothing to separate the two as both kept taking points alternatively before Srikanth managed to grab the upper limit of 30 points first to pocket the game and roar back into the contest. In the decider, Srikanth continued his momentum surging to a 11-4 lead at the interval. Prannoy caught up at 16-16 before Srikanth again moved ahead to seal the contest.